So last year I looked at the chicken coops I already had and adapted one that wasn't in use. I had a few spare as I had switched over to the pastured pens that I had made up. 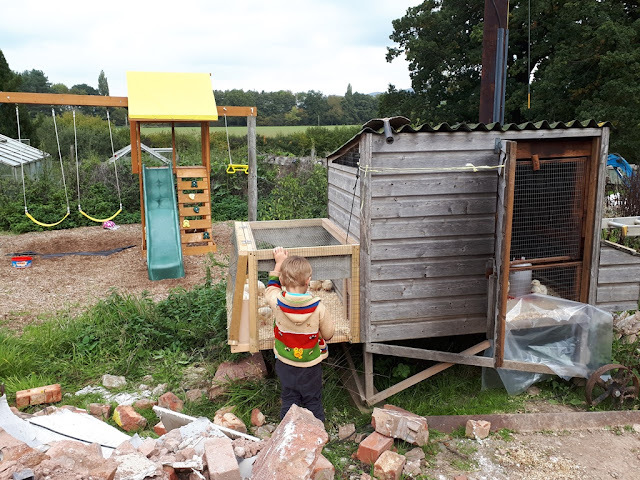 The coop I adapted was ideal. 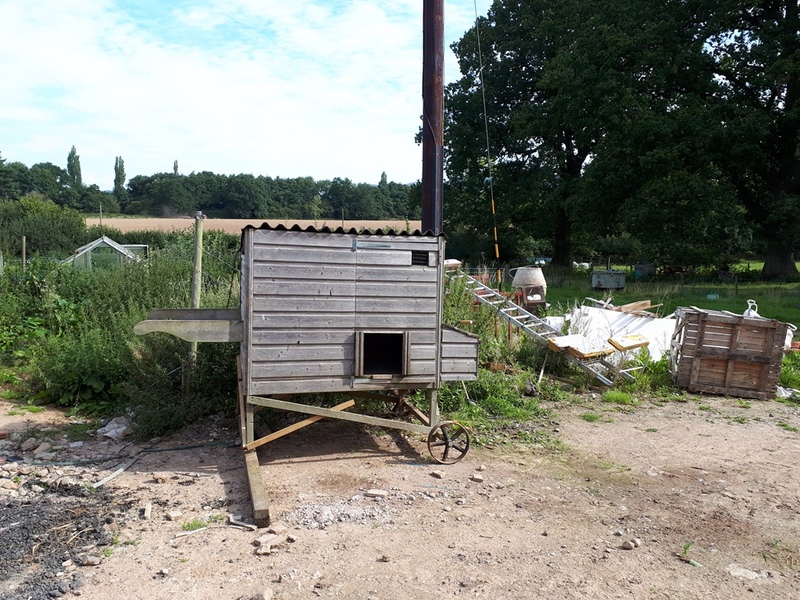 It had a big enough floor space to house 20 or so chicks, a large door I could open in the day to allow plenty of ventilation and a nest box where I could keep the extension reel. It was also up off the ground (stops rats and other rodents from making homes under it and better for my back!) and it's on wheels so could be moved when needed. This year I've decide to make the area a little bigger. 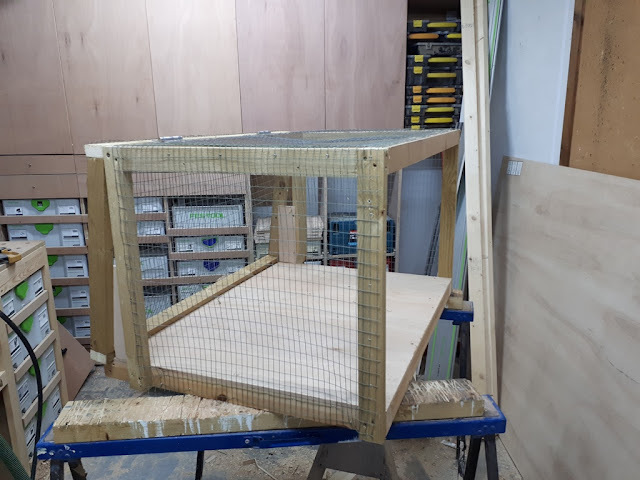 This will give the chicks a bit more space to run about and get away from each other. 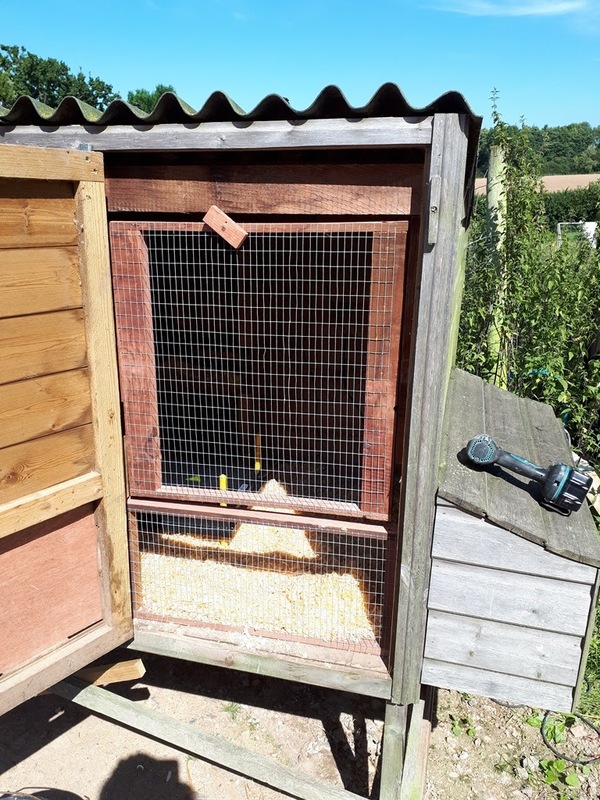 This new area is outside, my thinking is it will help harden them up a bit quicker as they can get away from the heat a bit more, although it might slightly slow their growth as they will need to put more energy into producing their own heat. 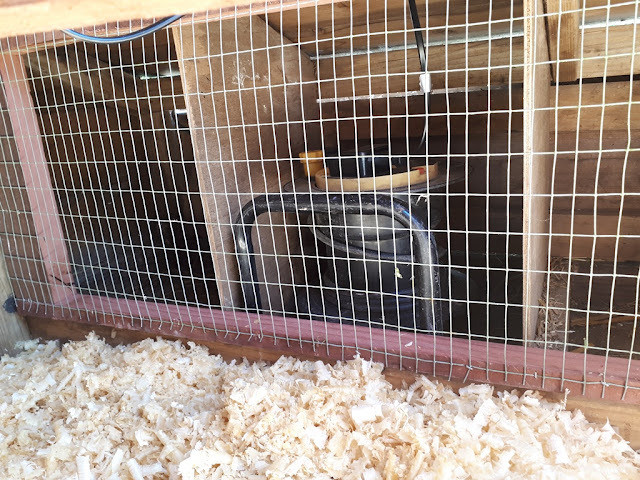 I wanted to make sure that this "extension" is easily removable and can just be added to the coop when I need it. I might still want this as a normal coop at some point. I designed it to slot over the carrying handles on the coop and fixes with a couple of screws. The whole thing is covered with aviary mesh and the back opens up should I want access to the inside. As it's been wet this weekend I've covered it with some clear plastic and the chicks have loved sitting out there watching the world go by! 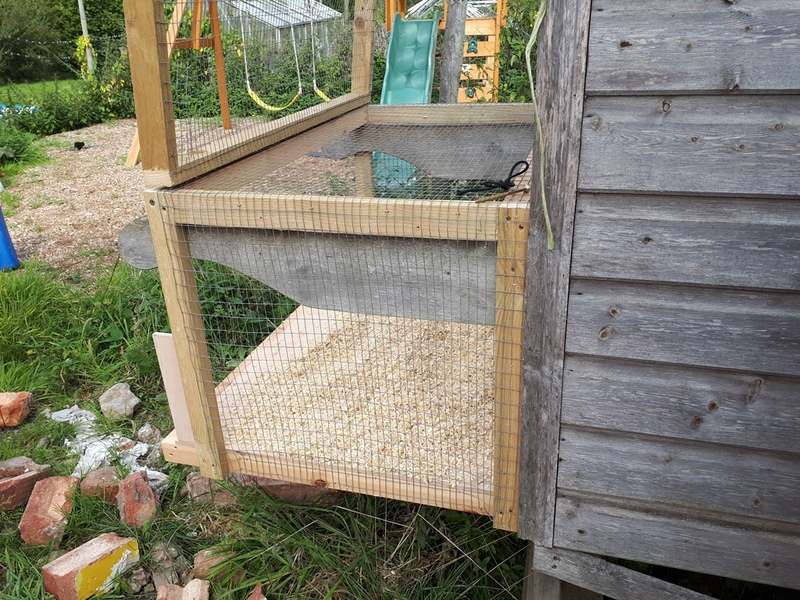 I might have to add a more permanent roof to it at a later date I think, but I like the open sides and think it's good for the chicks to have access to a bit of fresh air when they want it. I will also add a second feeder and drinker in there this week to give them a reason for going out there. So here's the new coop with the extension on the back. the boy is loving it and if I can't find him at any point I know exactly where he'll be! Hopefully the 26 chicks should grow nicely in there to about 4 weeks old when I'll take them off the heat and put them in the pasture pens to grow on until they're at the size we want. 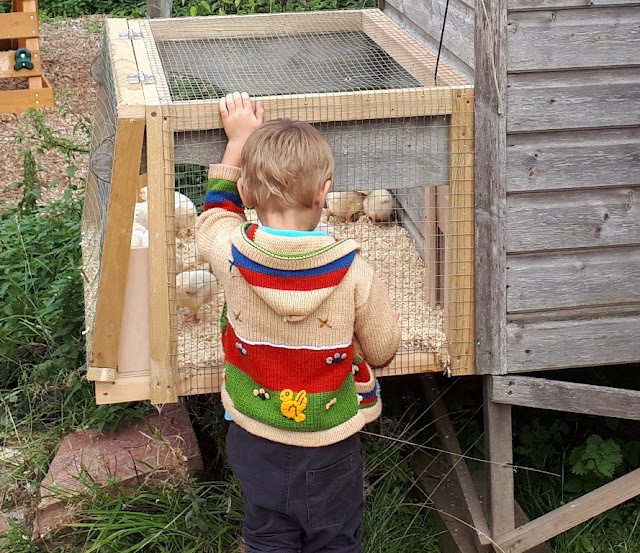 What do you use for a brooder if you have chicks? Very clever Kev, I love seeing your solutions. Thanks! I love thinking outside the box - just outside in this case! We did something similar with our baby birds. 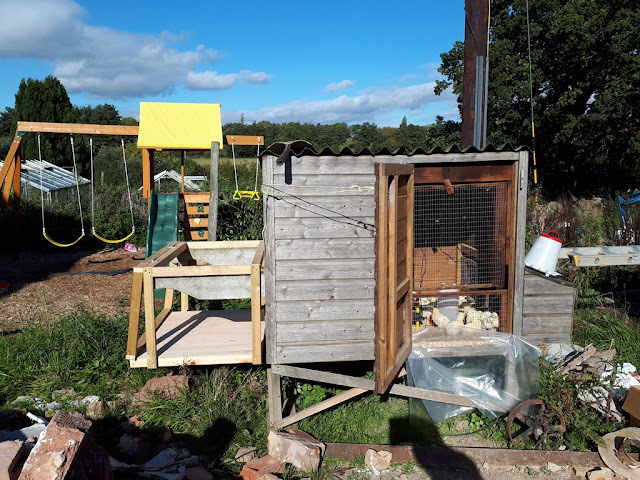 We had an ebay coop and run, and stuck the brooder plate in the nest box for the babies, and an extension lead in the next blocked off net box with the lead to the house. Worked a treat! And still useable for adults. It's great to have things that are fuel purpose. I love that within about 5 month as this can be a normal coop again. That said I'm loving my pasture pens for my other birds, it's just great that I don't have to clean out any pens and that they have access to fresh grass all the time. I love it. I keep my chicks in the laundry room in a metal dog kennel, when they get big enough I put them in a pen inside my henhouse with the other hens. I remove the pen when they are about 4 months old. Our house, even with the extension, would never have that k8nd of space. Houses in North America are about double the size of what we have here for the same number of bedrooms. I grew up in a big house though but no way would mum let us have birds inside then. We did have a converted barn and used to brood them in there when we used to hatch out some pure breed birds. I used to make a pen out of a sheet of bent cardboard with a heat lamp. This was great until we hatched some quails and I found out the hard way that they can fly very early in their lives. My sister and I spent a day trying to find all the chicks that had escaped! We heated it from then on! The couple of times we've had chicks they've gone in the dog crate. Luckily our dog is very laid back and didn't mind being evicted! As you said though, not ideal and we'd have to find a better solution if we did it regularly. I kept looking at cleaning an area of my workshop or a storage area but it would have been so much work and they're so messy over a four week period. The downside to This is four week is going to be max for this number of chicks in here. If I ever want to do bigger batches then I'll have to make something else. That said batches of 25 is as many as I want to deal with at the moment and perfect for our sized family to help fill the freezer for a bit.